DIY Income Investor: Is the US Bankrupt? The DIY Income Investor portfolio is limited to securities quoted in Pounds Sterling on the London Stock Exchange - and I don't recommend currency speculation, unless you really know what you are doing. However, most of the companies and banks that are quoted on the FTSE are participants - to a lesser or greater extent - in the worldwide economy. And the main engine of that world economy is the US. 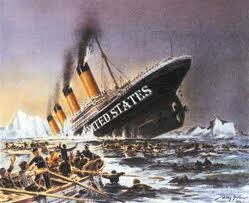 But is it possible that the US is already bankrupt - a dead man walking? If you think I am exaggerating, take a look at Kung Fu Finance's analysis of US national debt - it is based on the work of others, including Zero Hedge and includes a video from Anthony Robbins - a self-avowed political independent. Bottom line: the US government is $16 trillion in debt (which is an inimaginably huge number) and the debt is still growing. The inescapable conclusion of the presentation is that there is no easy solution. Measures like taxing the rich or abandoning the war in Afghanistan just do not begin to address the fundamental problem. The US government is spending beyond its means; future expenditure is way beyond expected income - one definition of (future) bankruptcy. What is more, there is no evidence that either of the presidential candidates has any kind of a plan for dealing with the situation; neither is pressing the 'panic' button - both are downplaying the problem. So what happens next year - and the next? US Government cuts, more US borrowing, higher taxes and more inflation (because the only politically acceptable solution is to artificially stimulate the US economy by printing money). The US economy itself is still strong and innovative - it is the government that has failed to behave responsibly and ultimately risks weakening the economy itself through increased unemployment and reduced domestic demand. Should we be worried? Of course - because the UK government finances are in an equally imbalanced situation - as are those of many other European countries. And we are all bound together by international trade. And China is, of course, the rising international star. A good question to ask is: what is China investing in? They are buying access around the world to raw materials and food. Does that mean Australia and Canada are the new markets to target? Food for thought? Do you have any insights? Retired? Get 25% Instant Return!